“Doubt Your Doubts Before You Doubt Your Faith” (aka, “What to do with Our Doubts”)… | Brian Mickelson…. Well, first off, President Uchtdorf said much more than that. Here are some highlights from his talk, which will give you a little more context for his thoughts on doubting our doubts. That shared, let’s take a quick look at what to do with doubt. President Uchtdorf is speaking to a different group of people in a different situation. Take me, for instance. I certainly have questions. Doubts? I don’t know. But questions? A lot of them. But let’s put them in context. I was born to parents who are believers. I was raised with a lot of truth. I had periods of doubts as a young person and questioned a lot of what my parents taught and what my church believed. I spent some time wondering if I knew for myself whether the church was “true”. I never doubted the reality of God and His Son Jesus Christ. I never doubted that there had been prophets and apostles on the earth. But I wondered a little about Joseph Smith and the Book of Mormon, along with other aspects of the church and gospel. Slowly, through a lot of pondering and study and prayer, these questions were answered. Nothing major, just small spiritual reassurances that what I had been taught was true. I also received some big, hard-to-ignore answers. Sure, I still had questions, and I still have questions. That probably won’t change. But at this point, my questions (or doubts) are facing 90% truth. There are some things that I already know. There are a lot of things I already know. They are the basics, but I know them through the power of the Holy Ghost. So at this point, when I have doubts, I should start by questioning them. I should do that as opposed to “starting over”. Every time I find something that I don’t understand and that causes a hint of doubt, I don’t need to start completely over in my faith, wondering if everything I’ve ever been taught is true. How would I make any progress? part of learning spiritual things “line upon line” is standing on the strength of the last line I received. I already know some things. I know them, and the questions will be answered slowly. I refuse to ignore my questions and doubts. They’re real, and they’re useful. I also won’t progress by completely ignoring them. But I won’t–I can’t–ignore what I already know to be true. And in that spirit, I will doubt my doubts before I doubt my faith. 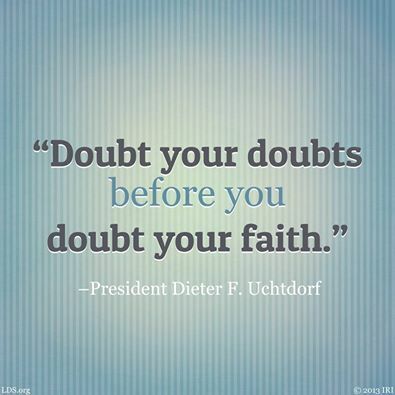 This entry was posted in LDS, Mormon, personal life and tagged dieter f. uchtdorf, doubt, doubt your doubts, faith, general conference, Joseph Smith, LDS, Mormon, October 2013 general conference, uchtdorf on October 7, 2013 by BJM. 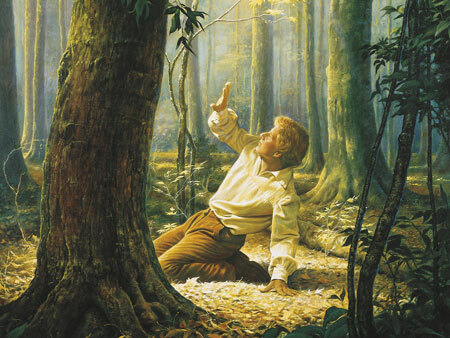 I do feel that comparing Joseph Smith’s first vision experience, to what President Uchtdorf was talking about is a bit like comparing apples to oranges. And I think you summed it up well in this post, Joseph didn’t start over, he stuck to what he knew was true, and he asked about what he didn’t know. Joseph’s question was sent vertical, I think President Uchtdorf was warning against staying horizontal; or in other words, allowing the doubts that come from other people, or from inside yourself, to keep wearing away at what you already know is true without ever seeking answers from the Divine Source. Trusting your doubts leads to a rebellion of your faith, doubting your doubts reinforces what you already know is true, and sends you, like Joseph, to seek answers through prayer and revelation. Thanks for sharing your insights. I find it very enlightening.